Stocks closed higher Tuesday as tensions in Crimea seemed to fade and investors started to focus on what the Federal Reserve may have up its sleeve. 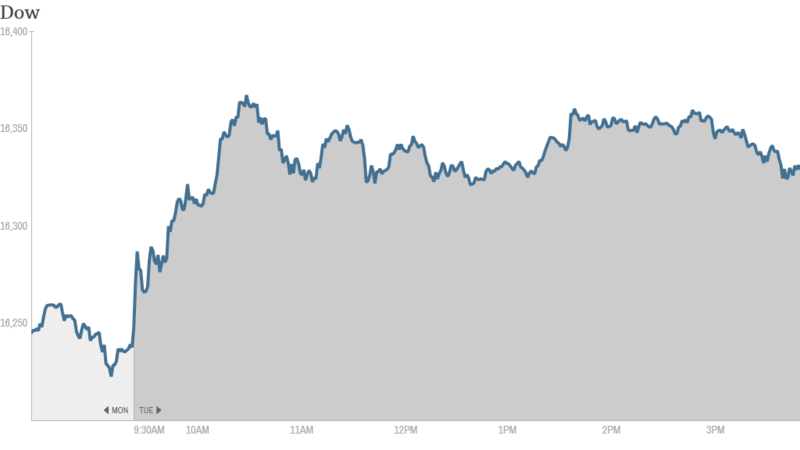 The Dow and S&P 500 were each up more than 0.5% while the Nasdaq surged more than 1%. Investors are hoping for bullish signs from the Fed, which will conclude its latest policy meeting on Wednesday afternoon. Janet Yellen, the new Fed chair, will give her first press conference after the meeting. It is widely expected that Yellen will continue to trim, or taper, the fed's stimulus program by another $10 billion, to $55 billion a month. The markets will also listen closely to any possible changes to the Fed's guidance on interest rate changes. The Fed will have two new pieces of data to look at as it begins its meeting. Consumer prices edged up by 0.1% in February. Food prices jumped 0.4% - the largest increase in nearly 3 years. But inflation is not a huge problem for the Fed or economy right now. And there were mixed signs about housing. Construction of new homes fell by 0.2% in February, but building permits, a sign of future construction, rose 7.7%. The Dow snapped a five day losing streak on Monday. The S&P 500 is now back in positive territory for the year, while the tech-heavy Nasdaq remains the top performer of the major indexes. But investors still have one eye on the situation in Ukraine. It will likely continue to dominate the headlines, putting further strains on Russia's relationship with the U.S. and Europe. Russia is not backing away from plans to annex Ukraine's Crimea region despite targeted sanctions announced Monday. 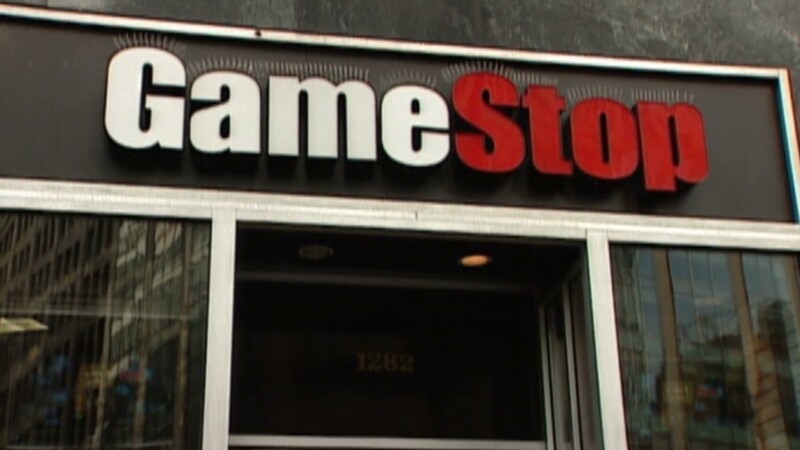 On the corporate front, shares of GameStop (GME) fell after Wal-Mart (WMT)said it was getting into the used video game sales market. One trader on StockTwits felt the drop was justified. "$GME If you were a primary dealer of used cars and a large company said they were going to sell used cars too, do u think your margins would rise?" asked DanDaMan. Shares of Microsoft (MSFT) rose to a 14-year high on expectations that Microsoft may soon announce a version of its Office software for Apple's (AAPL) iPad. Microsoft was the top gainer in CNNMoney's Tech 30 index. "How much is Office for iPad worth? Microsoft's stock market value up about $14 billion this morning!" quipped ampressman. Chipotle Mexican Grill (CMG)was moving higher after RBC Capital Markets analysts said in a note that it has "increasing confidence in the company's ability to sustain its recent momentum." But contrarianspeculator questioned today's climb. "$CMG: today's jump amounts to 20% more than CMG is forecasted to earn in all of 2014 -stock getting ahead of its fundamentals?" The sentiment was echoed by StrayTrader. "In this bizarre market, a share of $AAPL that earns $40/yr EPS is $529, while a share of $CMG w/$10/yr EPS is $592 because it has growth .. umm to $40?" Shares of FutureFuel (FF)surged after the biofuels maker reported better than expected earnings. One trader was excited about the stock's move to more than $20 a share. "$FF Bought this last year at 11, been holding, and will keep holding long term," said maetrader. But goprules was more critical. "$FF way too much hype on earnings. Much ado about nothing." Also, shares of Hertz (HTZ) rose after it announced earnings and said it would spin off its equipment rental business to pay off debt. Oracle (ORCL) fell in after-hours trading after reporting fiscal third quarter revenue that were slightly less than expected. Adobe Systems (ADBE) reported fiscal first quarter revenue and earnings that topped forecasts.